Elite Fitness has endeavoured to bring together its highest quality, most innovative range yet, the Elite 2016 Winter Cardio Collection. 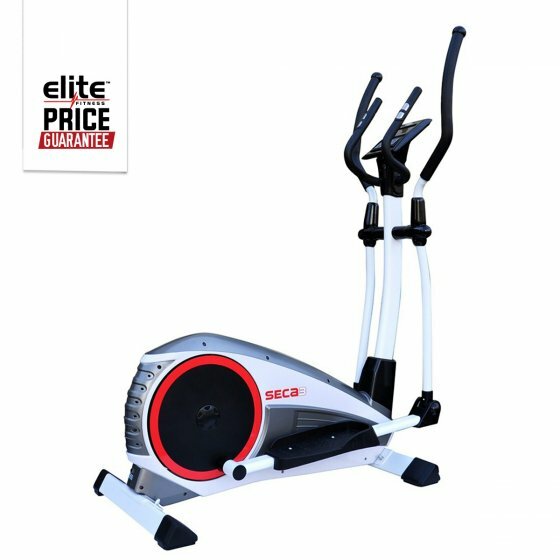 The Elite Seca 3 Cross Trainer has been crafted with a heavy duty frame, supporting a maximum user weight of 120kg. With 16 built-in Workout Programmes to choose from, you will be kept motivated to achieve fitness goals and stick to your fitness regime. The Seca 3 Cross Trainer is suitable for any stage of fitness, with 16 levels of Silent Magnetic Resistance you can select the difficulty that best suits you. Engineered with a Rear Drive System and 13" stride, this Cross Trainer simulates a walking motion that feels very natural. Feel confident and secure at high speed with Non-Slip Foot Plates to keep you safe on board. The Dual Colour LCD screen tracks your workout, so you don't have to! Providing workout statistics on Speed, Time, Calorie Burn and Distance. Monitor your heart rate with the touch of a hand, just hold on to the Grip Sensors. High heart rate = a highly effective workout! When you've completed your routine, wheel the Seca 3 away and store it with ease! Flywheel: 5.5kg Heavy Precision Balanced Flywheel. Stride Length: 13" stride activates the most muscle within the elliptical motion.